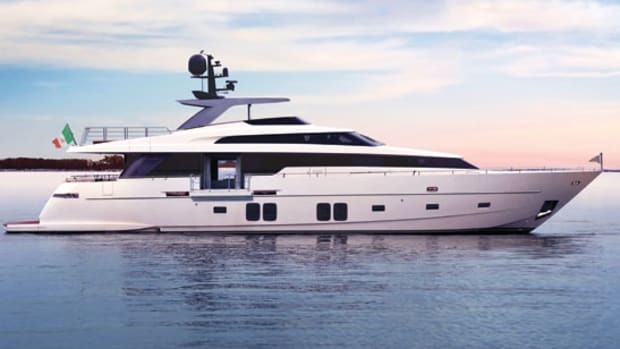 With its new flagship SL 118, Sanlorenzo tells the world it’s here to stay. 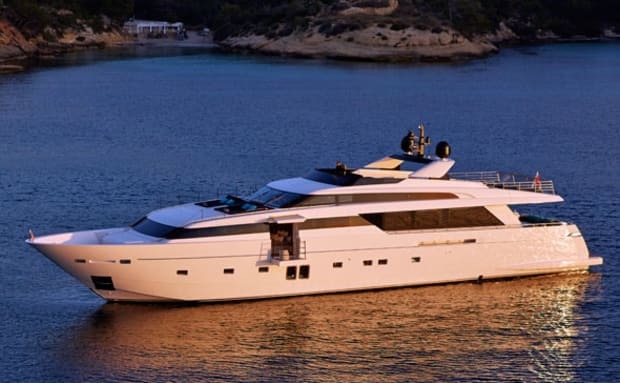 When Massimo Perotti left his top management position at Azimut Yachts nearly ten years ago to buy out Sanlorenzo from its retiring founder, the Ameglia shipyard was a respected builder of bespoke fiberglass motoryachts, with a notably traditional look. After 50 years in business it had just celebrated completing its 500th vessel, at a time when Azimut was building that many boats in a year. Perotti described Sanlorenzo at the time as “sleeping.” When I wondered why a man with a plum job running one of the most successful boatbuilding operations in Europe would want to take such a risk, he told me: “I wanted to test myself.” He had been with Azimut for more than 20 years when he decided to quit, and had identified in Sanlorenzo a unique and irresistible opportunity to make his mark: It was a company that had an excellent reputation, a deep well of skills and experience, and serious development potential. Perotti set about waking the shipyard up. 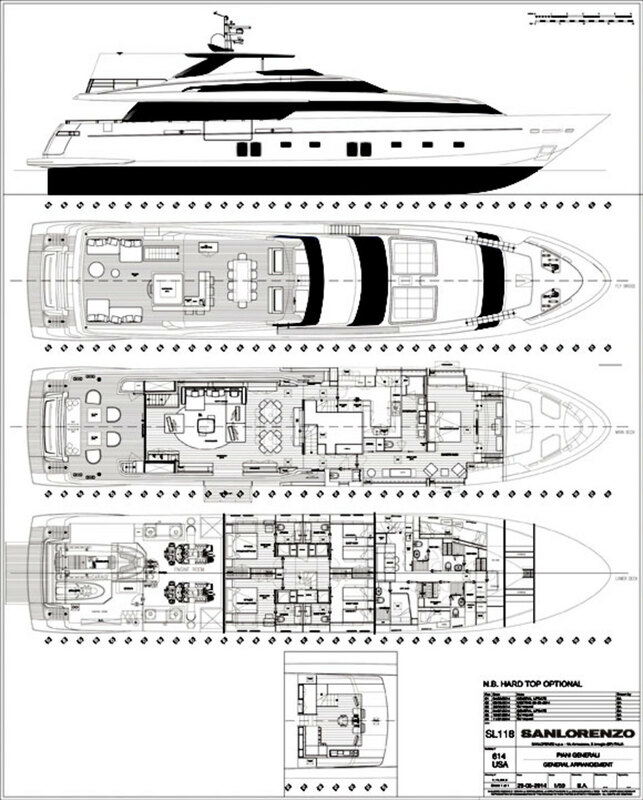 In short order a new range of semi-displacement fiberglass yachts was conceived, designed, and put into production, and at the same time he set up a new shipyard in Viareggio to handle very large superyacht orders in steel and aluminum. 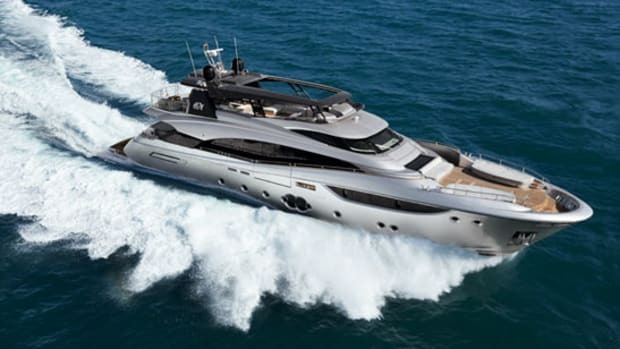 Then he turned his attention to refreshing the existing product range, an attractively conservative portfolio of motoryachts from 62 to 108 feet. Sleek and well-proportioned, the 118 has the sort of subtle styling, courtesy of Francesco Paszkowski, which will probably look as classy in 20 years’ time as it does today. 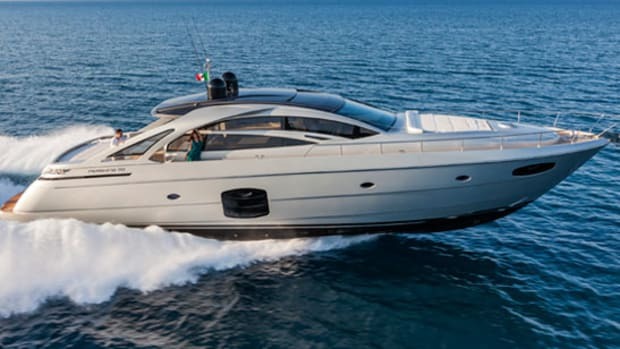 Sanlorenzo’s yachts have always been imbued with a sense of quality, and this first 118 was no exception. A lot of carbon fiber has been used to stiffen the superstructure, moldings are vacuum-infused, and all mold tools were manufactured using a computer-controlled five-axis router. The accommodation is founded on floating aluminum frames to aid sound insulation. 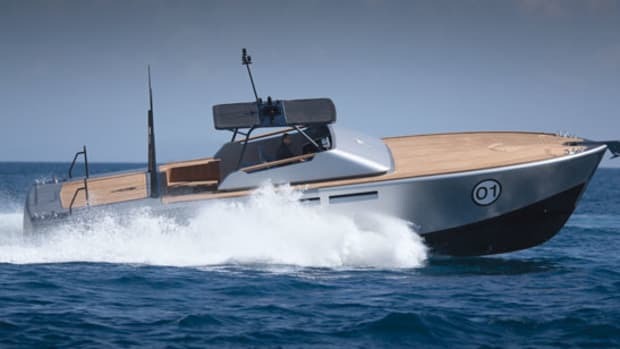 Under 53-year-old Perotti’s dynamic, new-broom leadership, the yard certainly seems to have woken up, and it claims to have 25 firm orders for yachts of 82 to 200 feet for delivery over the next three years. But the most important thing about Sanlorenzo remains the same as it’s always been—each boat is built to order and no two are exactly alike. So not only will the décor and interior design reflect the owners’ requirements—and this 118 had a very modern interior featuring a lot of glass and steel, leather flooring in places, and some excellent furnishings by Boffi and Paola Lenti—but the layouts will too. One of the first decisions to make will be where to put the galley, and it’s not a choice to make lightly. Place the galley down below in the amidships crew area, and you free up extra space on the main deck, which benefits the owner’s suite. Alternatively, placing the galley on the main deck means that the crew accommodation can be moved forward, so space lost in the owner’s suite is gained down below, in the guest cabins. Our test 118, the first to emerge from the Ameglia assembly sheds, had the lower galley, linked to the main deck with a food lift—although in a quirk of this particular 118’s layout, the main dining table onboard is up another level, on the yacht’s impressive upper deck. 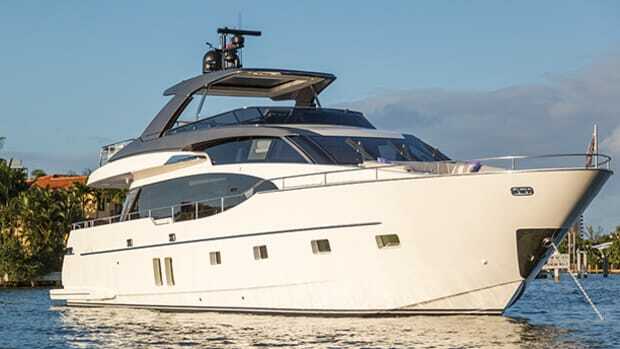 The four relatively modest guest suites are all of similar size, although the aft pair benefit from substantial hull windows and significantly bigger beds. After so many years in business, the designers at Sanlorenzo have more than a few tricks up their sleeves. One of those tricks can be seen on the 118’s accommodations level. 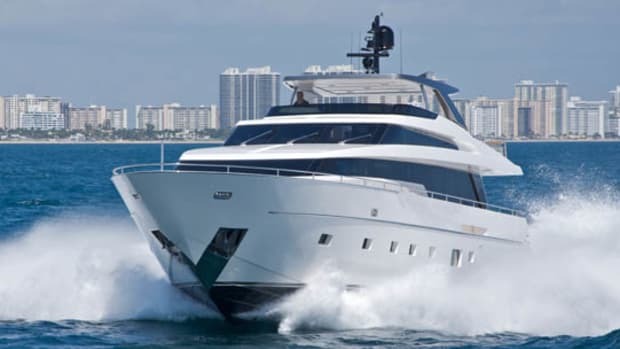 Though it certainly doesn’t lack for space, particularly since headroom throughout the deck measures a Lebron-esque 6 feet, 8 inches, the suites may be a little bit smaller than one might expect for a yacht this size. To combat that slight drawback, Sanlorenzo went ahead and installed full-height mirrors in strategic spots, as well as spectacular longitudinal glass bulkheads that make the deck feel bigger and airier than it already is. The combination of the headroom, mirrors, and resplendent glass all combine to help the 118 make the very best use of her space. And that’s smart design. Which brings us to a paradox at the heart of this layout. These guest suites are not big, but they are made to feel quite spacious (see “Better Boat: Reflective Design,” right), while the owner’s suite, with its large head forward and a separate dressing room, occupies a vast area of the main deck, but actually feels quite small. It’s odd, and there are two reasons for it. The first is that the main area of the suite is divided longitudinally, by a full-height glass bulkhead, into a sleeping cabin and an office, so there are none of the uninterrupted sightlines that are needed for a big space to actually look big. The second reason concerns the optional balconies. This is a full-beam cabin, naturally, so there are no sidedecks with bulwarks that can be folded down, and no sliding glass side doors. The balconies unfold from the sides of the cabin itself. When they are open the effect is superb. But when they’re closed those windows are rather small and rather high. 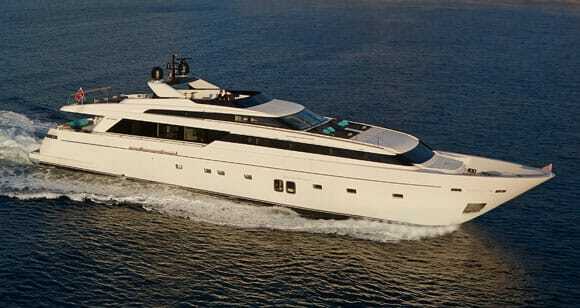 This new flagship will eventually replace the Sanlorenzo 108 in the shipyard’s line-up. 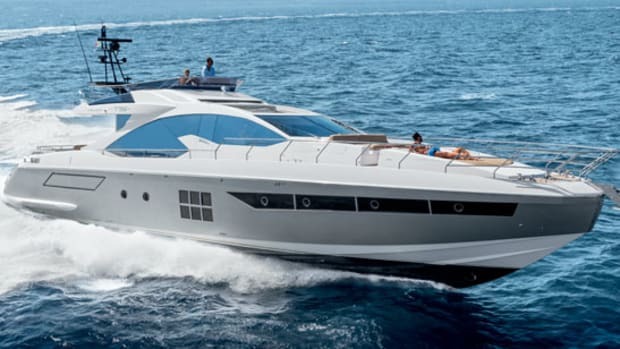 It has a voluminous, all-new hull which is a foot wider than the 108’s, with a 16-degree deadrise aft and a choice of engines. 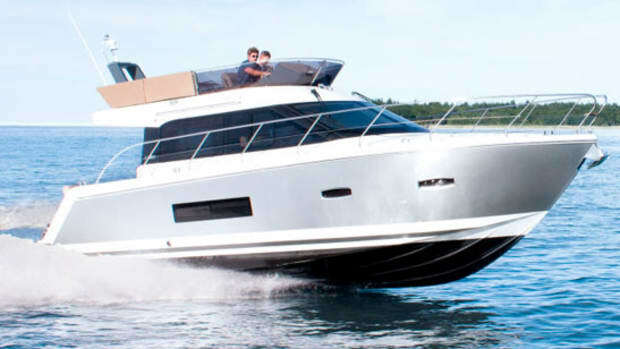 Our test yacht had twin MTU 2000-series V16s producing some 2,600 horsepower apiece. As an alternative you could specify a pair of the gigantic 4000-series motors, which, although pushing out an additional 545 horsepower each, add considerable weight: nearly six tons per side. It seems like a lot of extra metal for the additional two knots that Sanlorenzo predicts. Predictions can be tricky, of course, and Sanlorenzo’s top-speed estimate for our particular 118 proved a little optimistic. We clocked the yacht at just over 26 knots in two directions, which seems pretty respectable considering we were moderately well loaded with fuel and water, and had all three tenders stowed in the garage: a Williams jetRIB, a Seadoo, and a Jet Ski, which between them added a couple of tons right at the stern. We detected a slight, low-frequency vibration at high speeds too, which Sanlorenzo’s engineers felt might possibly be caused by turbulence in the propeller tunnels, and was perhaps exaggerated by the rigidity of the carbon-reinforced superstructure. But the yacht had only recently hit the water, and such teething troubles are usually to be expected. With electronic CMC fin stabilizers keeping it resolutely upright in the tightest turns, the 118’s handling was poised and precise at all speeds. For a vessel of this size it felt remarkably alert—awake, even. In rousing Sanlorenzo from its comfortable sleep, Massimo Perotti did more than merely “test himself.” He undoubtedly secured the shipyard’s future. Corporate slumber just hasn’t been an option in recent years. 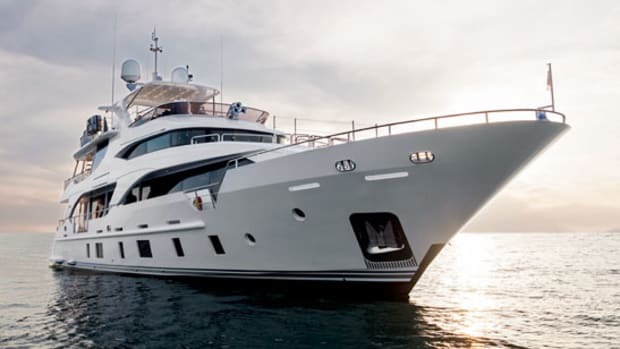 But although the new designs and 60-meter superyachts get headlines, he has never lost sight of the fact that the soul of the shipyard lies in the timeless, classic style of craft like the 118—wrapped around a high-tech core, of course. Click here for Sanlorenzo’s contact information and index of articles. 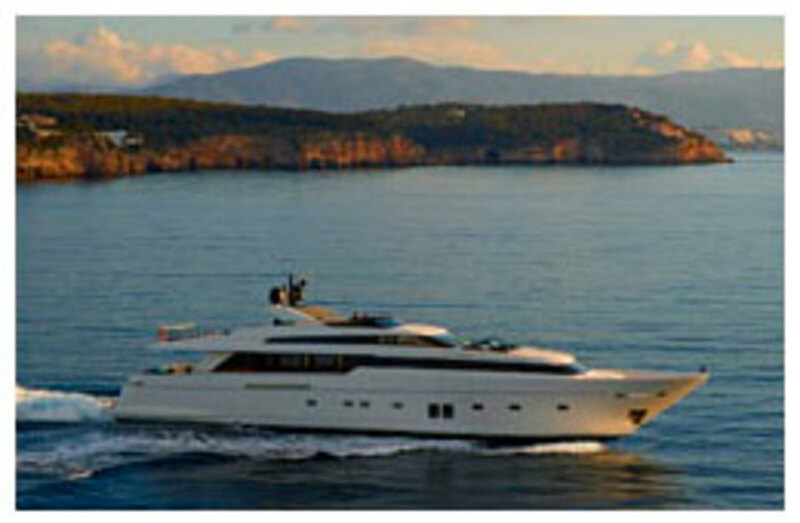 Click to see listings of Sanlorenzo Yachts currently for sale on BoatQuest.com. 1,809 gal. fuel, 594 gal. water, 17 persons, 5,000 lb. gear. This article originally appeared in the November 2014 issue of Power & Motoryacht magazine.